Derek Sheils qualified fifth fastest on the Cookstown B.E. Racing Suzuki for the Dundrod 150 Superbike race. The opening races of the 2017 MCE Ulster Grand Prix take place on Thursday around the legendary Dundrod course. Peter Hickman's 132mph lap during first practice on Wednesday on the Smiths BMW has raised expectations ahead of day two, with the British Superbike contender set to start from pole position in the Dundrod 150 Superbike race - the headline event on Thursday. Michael Dunlop has been making steady progress with the Bennetts Suzuki at Dundrod. Roads are closed around the course and will reopen no later than 9.30pm. 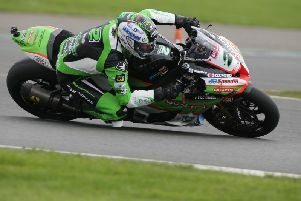 Peter Hickman set the pace on Wednesday in the Superbike, Superstock and Supersport classes.